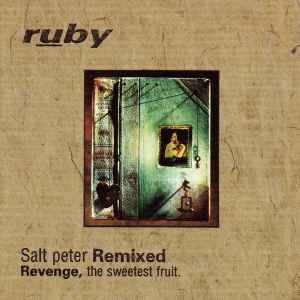 This is a 2xCD compilation: the original 'Salt Peter' disc (Work OK 67458) and 'Salt Peter Remixed' (crecd166r). It seems this compilation uses some version of both booklets and both CDs, but these aren't unique to the release. It's difficult to tell which booklet should display in the front of the CD. As per images, the tray/spine is the Remixed tray/spine (Ruby - Salt Peter Remixed. Revenge, The Sweetest Fruit). The spine reads: "Ruby Salt Peter Remixed a creation records product crecd166r"
Back of tray reads: "All songs produced by Mark Walk and Lesley Rankine. ℗&© 1996 Creation Records Ltd. 109X Regents Park Road, London, NW1 8UR. Made in England. Distributed by 3MV/Vital."